In a blog post on the New York Times website several days ago, Amber Scorah told the story of how her 3-month-old son Karl died three hours after she left him at a day-care center for the first time after the end of her maternity leave. A mother of a 2-year-old, I felt terribly sad reading this article that has been attracting a lot of people's attention to the situation of newborns, new moms and childcare in the US. The reason for Karl's death is uncertain, but according to Scorah caretakers noticed the baby had been kicking his legs in his sleep 20 minutes before he died, but that they dismissed this behavior. "The day-care owner had also put Karl down to sleep on his side, which is a known unsafe sleep position," Scorah wrote. In her piece, Scorah wonders if Karl would still be alive if they had checked on him when they noticed the kicking, or if they had put him to sleep in a safe way. With no answer in sight, she wrote, "What I do know is that had I been with my 3-month-old son, I would have gone over and checked on him at that moment. What I also know is that my son would have been safely on his back to sleep." As we all know, babies can encounter some subtle problems during their early vulnerable period. As parents, we can only do our best to avoid such situations, and if any arise, to stay alert so we may take measures as soon as possible. This is why who takes care of our children is so important. "My infant died in the care of a stranger, when he should have been with me," the heartbroken mom wrote as part of her campaign for the establishment of a paid parental leave policy in the US. Reading the article with a heavy heart for Karl, I suddenly realized that when faced with the question: "Where do I send the baby after I go back to work?" Chinese mothers are probably luckier. While our maternity leave is roughly the same three to four months, the thing is, when Chinese mothers have to leave their little baby for work, they mostly have a trusted hand to take care of their children instead of strangers. Right, it's the baby's grandparents. Having grandparents take care of their baby grandsons and granddaughters is almost the norm for most families with a new baby in China. A long-standing tradition in the country, it has been criticized a lot in recent years as more advanced ideas about education have begun to dominate among the new generation of parents. The drawbacks to this are easy to see. For instance, a child taken care of by grandparents is more likely to be spoiled and less disciplined, which makes it more difficult for them to get along with other people. Clashes between the child-rearing styles of young parents and older generations are also inevitable. Many young parents usually feel having their parents or parents-in-law step in as caretakers isn't something they do because they have few alternatives. Lacking mature day-care centers for infants, moms in China seem to have only two choices: asking for help from their parents, or themselves or their husbands quitting their job. 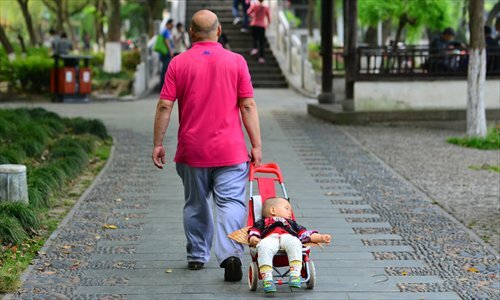 While some may consider employing a baby-sitter, that actually requires a family member, usually a grandparent, to supervise too, as baby-sitters in China still lack sufficient training. Among the two choices, most parents, like me, choose to keep their jobs. Burdened with mortgages and the financial pressures in bringing up a child, for the majority of Chinese families it's just not practical to have one parent quit their job. Financial reasons aside, not only is it near impossible to persuade a man to quit his job for a baby in what is still a patriarchal society, even modern women find being a full-time mother is too big a sacrifice. So in the end grandparents become the only people to whom you can turn. Talking to other parents that I know, except for those that work as free-lancers or have their own business, most full-time employed couples rely on their parents to take care of children too young for kindergarten. Some parents even send their children back to their hometowns to live with their parents when the latter cannot come to them - something I personally disagree with. I consider myself lucky that I managed to persuade my mom to come to Beijing after my daughter was born. Very conscious of the drawbacks, I was originally extremely against the idea and felt it was something that I was being forced to do. I even wrote articles pointing out the problems with the arrangement and it seemed many parents shared my feelings. Knowing that in other countries like the US there are professional day-care centers where full-time working parents can entrust their babies, from several weeks to several months old, I always dreamed about how wonderful it would be if China had these services as well. We wouldn't have to bother our parents and endure the headaches that constantly arise while trying to agree on how baby should be raised. Of course the grass always looks greener on the other side of the fence. Perhaps my dislike for this tradition blinded me to the advantages that grandparents bring. Karl's tragedy reminded me that the traditional grandparents day-care model, maybe only a tradition or relic in China, is not without its merits. As day-care centers grow more mature and capable, Chinese parents are lucky to have parents as an option. Sure they may have grown old and lost their willingness to learn new ways of doing things, and may teach your kid some out-dated behavior, but these issues can be dealt with through improved communication. What's most important is that our children are healthy. Grandparents are great, particularly for babies still in their vulnerable period, because they are family and care as much as we do about the baby, as such they tend to be very attentive and take measures as soon as they notice something is off. I still remember last year, when my daughter was 9 months old, my mother immediately took her to the nearby hospital just because she suddenly fell asleep right after laughing really loud. It turned out to be nothing and the doctor said she was just sleeping, but after reading Scorah's blog, I realize I'd rather have someone overreact to my baby's behavior rather than disregard it as Karl's caretakers seem to have done. So, if your parents or parents-in-laws are helping out with baby, make sure you help them out in return and let them know you are grateful.